There are few things I love more than a book launch. The books, the fans, the discussions...the books. Yeah, my mind has several tracks, but all of them lead directly to the closest book repository. Fortunately, May has been literally littered with book signings and launch events. 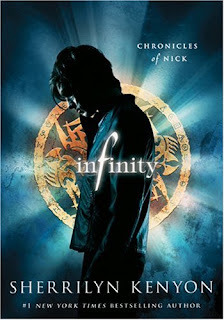 Earlier this evening Jody Wallace and I attended the release of Sherrilyn Kenyon's YA debut, Infinity: The Chronicles of Nick, at the Cool Springs Marriott in Franklin. And let me go on the record as saying, when Sherri launches a book, she does it right! Tonight's launch was fantastic. There were delicious (and healthy!) hors d'oeuvres, costumed attendees, and prizes galore. I even won a t-shirt, which is shocking considering my absolute lack of luck in the face of any raffle/lottery/diet/game of chance. What really set this launch apart? The level of attention and caring Sherri has for her fans. Tons of people, and every single fan got the opportunity to meet and speak with Sherri. It's inspiring, really, how in touch she is with her readers. Good times, thanks to Sherri, event host Sherlock's Books, and my wonderful date for the evening.